Perfect for wine displays and center aisle merchandising. 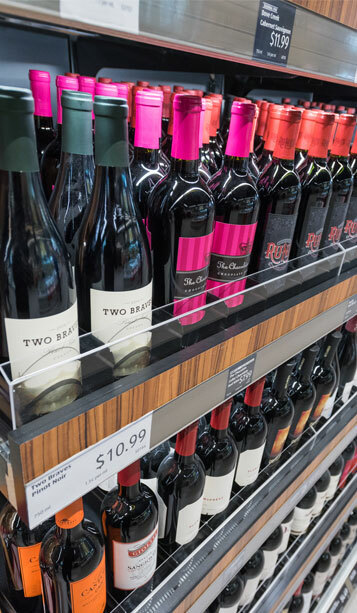 Our VersaSlide application is perfect for wine displays and center aisle merchandising. Designed to integrate with your existing gondola shelving, VersaSlide is the ideal way to introduce gravity feed shelving to an important segment of your store. Revolutionary silicone technology and thicker glide material ensures a longer lasting product giving the product a 10-year lifespan. Comb technology adjusts to any item width, granting the ability to flow a variety of products. Utilizing VersaSlide in the center aisle ensures consistently front faced products, eliminating unsightly gaps on your shelves. Gravity feed allows for quick restocking, eliminating the need to push products forward. Limited supply of products are always positioned for sale. Traditional shelving does not meet the needs of today’s wine market because the top shelf is unreachable for many shoppers. Our patented, VersaSlide® makes your “Top Shelf” wine self-facing. You will save significant labor, avoid shrink caused by breakage, and eliminate out-of-stocks. Don’t risk some of the most expensive products in your stores! to learn more about adding VersaSlide to your center aisle.